Tango teacher brings the flavor of Argentina to the Comox Valley with his close embrace tango classes. he teaches students like Christina Grandin, above, the close embrace tango on Wednesday evenings in Downtown Courtenay.” src=”http://www.infocusmagazine.ca/wp-content/uploads/2013/02/tango1-602×415.jpg” width=”602″ height=”415″ /> “I heard this beautiful music, and I liked the music,” says Claude Bigler of how he first came to discover tango. Now an instructor, he teaches students like Christina Grandin, above, the close embrace tango on Wednesday evenings in Downtown Courtenay. If you’ve been in Downtown Courtenay lately on a Wednesday night and you’ve taken a walk along England Avenue, you may have noticed something interesting happening through the windows of Café Barrio Fiesta. The tables and chairs have been stacked behind the counter to clear the floor space, and people are dancing tango. Not just any kind of tango. They are dancing close embrace tango, with the partners chest-to-chest and moving to the melodic strains of golden age (circa 1930s) tango music. The floor space is tight, but the classes mimic the sort of thing you might find in Buenos Aires, Argentina—the birthplace of tango. There, close embrace tango is the social dance of the community and it is danced by young and old. Certainly the diversity of people at Café Barrio Fiesta attests to the appeal of the dance. But how did such a class end up in Downtown Courtenay? The answer is a small group of instructors determined to share their love of the dance. One such instructor is Claude Bigler, a Swiss-German hairstylist and owner operator of Claude Bigler and Friends in Courtenay. For the past few years he has been introducing students to his preferred style of traditional tango de salón and close embrace tango. 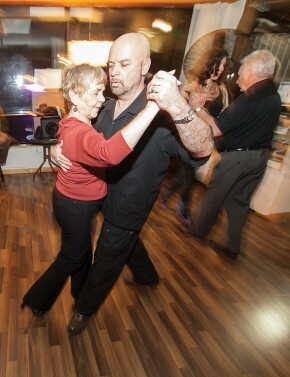 He is the instructor at Café Barrio Fiesta, and a passionate enthusiast of all things tango. Bigler of course would know. He learned to dance and teach tango in Buenos Aires under the tutelage of renowned tango instructor Nelida Teresa Boyer, and makes annual trips to Argentina for personal instruction and practice. However it wasn’t the dance that attracted Bigler to tango. “I heard this beautiful music, and I liked the music,” says Bigler simply of how he came to learn tango. You quickly realize, however, that’s an understatement. Bigler regularly breaks out in song during the Wednesday evening classes, singing the lyrics that most of his students don’t understand. He’ll also clap his hands, and move solo around the edges of the dance floor all in hopes of conveying to his students the emotion behind the song. In fact, musicality is at the heart of Bigler’s tango dancing, and he strives to teach his students how to interpret the sounds of the music through their dance steps. For Bigler, technique and dance steps are a means to an end, that end being your own individual dance style. It’s something fellow tango enthusiast and internationally renowned Vancouver Symphony Orchestra pianist Linda Lee Thomas relates to. Bigler and Thomas are long time tango friends, and on March 8 and 9, Thomas will be playing a tango concert at Studio Live in Cumberland. “For me, of course the music came first,” says Thomas. “I first heard Astor Piazzolla in 1988 in Vancouver, and it blew me away. That night I knew I had to play this wonderful music. It was many years after that when I heard there was an Argentine dance tango teacher in Vancouver. So I thought I should go along to a class or two, hoping I could learn something about the dance that would enhance my playing. Well I got hooked on the dance as well. For Thomas, playing and dancing tango has been an amazing artistic and personal journey. And when she had to cancel a private performance for Bigler’s 65th birthday party this past November, she decided to make up for it with another concert. Bigler decided an event like that needed to be shared, and together they created an evening of live tango music and dance to celebrate their mutual love of the genre. The event is open to the public, and anyone with an interest in tango dance or music. For the uninitiated, however, such devotion to a particular musical and dance form on the part of two people—let alone an entire foreign city—might be hard to believe. Let’s face it, the music is old and the dance is a product of the 19th century. Why would anyone today want to dance tango? Bigler has a simple answer—intimacy. In fact, tango, like all social dances, seems to tap into an innate human need for physical movement and contact. Bigler likes to refer to an Argentine Tango study out of Montreal, where researchers divided elderly study participants into two groups—an exercise group and a tango dance group. The idea was to see which offered more health benefits. The answer was tango. However, social dance is often seen as inaccessible and difficult, especially for men. That’s something Bigler can relate to. “My first dance in Buenos Aires, I sat and watched. I picked a woman to ask to dance,” he says. “What I didn’t know was you asked someone to dance like this!” Bigler tilts his head to one side and raises an eyebrow in something that is a cross between a question and a come-hither look. A potential dance partner so asked will then either tilt their head and raise their eyebrow in acceptance or shake their head to decline. Bigler instead walked across the dance floor and asked this woman to dance. She promptly and emphatically declined him. In fact, to hear Bigler tell the story, it was something more akin to a public shaming for not following the rules, and he was deeply embarrassed. He left the dance floor convinced he would never learn tango, and was instead determined to make the best of his trip to Buenos Aires by going fishing in Patagonia. Instead, fate intervened and the woman who so sharply rejected him on the dance floor ended up introducing him to a dance instructor who would teach him the basics. In fact, you may not actually need to know how to walk. A part of Bigler’s training to become a teacher of Argentine dance included instruction on how to teach differently abled dancers. He worked with amputees, people with mobility issues such as injured knees and those who needed mobility aids such as a cane or brace. “Everyone needed a different approach,” remembers Bigler, yet, everyone could do it. And that’s something he likes to remind his female students who may experience frustration with their male dance partners who aren’t picking up the steps as quickly. Certainly, tango dancers speak of the rich non-verbal communication they experience while dancing. Tango is about lead and follow, and that requires an understanding not just of the music, but also of one’s dance partner’s mood, abilities and inclinations. Bigler himself has had more than one experience of traumatized female dance partners pulled around the floor by clueless partners, who have expressed deep appreciation for his ability to shape his dance according to the moment. As you might guess, trust is a big part of the experience as well. Each new song and each new dance partner is an opportunity to express oneself, and learn to move in cooperation with another person. “It’s almost like a drug,” declares Bigler. To purchase tickets for the Night of Tango with Linda Lee Thomas, call Claude Bigler at 778-992-0029. Tickets are available for March 8 only. For more information about close embrace tango dance lessons, drop by Café Barrio Fiesta (on England Avenue between 5th and 6th streets) at 7pm on Wednesdays.